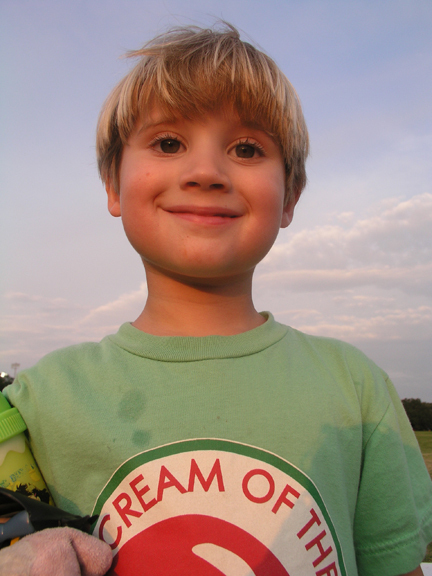 Today, my amazing little boy turns 7 years old! Funny, isn’t it, how seven years can seem simultaneously like a lifetime and like it has passed in the blink of an eye? I can’t believe he is growing up so fast. . . . and I can hardly remember my life before him. Everything is better with this happy, funny, exuberant kid around. We are in full party planning mode this week! 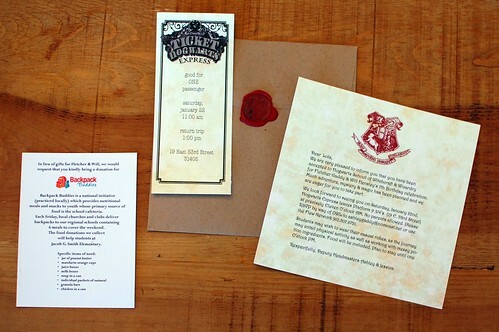 In just a few days, our house will be transformed into Hogwarts School of Witchcraft and Wizardry for a 7th birthday extravaganza for our sweet Fletcher and his buddy Will. It is such a fun party to plan, and I am so happy to be doing it with my dear friend (and Will’s mom) Jessica! (practiced locally) which provides nutritional meals and snacks to youth whose primary source of food is the school cafeteria. Each Friday, local churches and clubs deliver backpacks to our regional schools containing 6 meals to cover the weekend. The food donations we collect will help students at Fletcher and Will’s school, and will have a far greater impact than a handful of new toys for two boys who have everything they need. Fletcher, for his part, wasn’t entirely sure about this gifting direction – he knows there are people who need things more than he does . . . but what kid doesn’t love getting gifts, right? In the end, I think this party is going to be so fabulous he won’t even think about gifts. We have sooooo much planned!We will probably pull out some of the Halloween decorations to help set the tone. 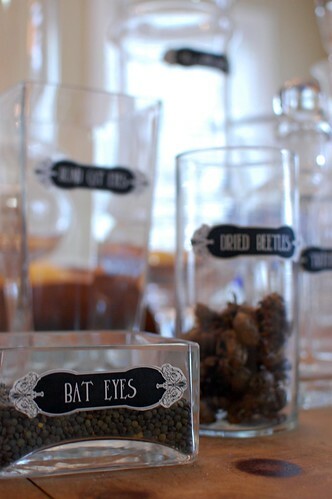 I am also working on a collection of magical ingredient and specimen jars that are looking really great so far! I found the inspiration (and some great printable labels) here. When the guests arrive they will be sorted into the 4 Hogwarts houses (with the help of a sorting hat borrowed from my sister) and each will receive a fleece scarf in their house colors.I made the scarves using scrap fleece on sale at Hancocks – the lot of 24 cost less than $20 to make, which isn’t a bad price for a party favor. Plus, it has been crazy cold around here so the scarves could come in handy as I’m pretty sure we will not want to keep 20 boys (and a few sisters) cooped up in the house if we don’t have to! Then, let the games begin! We will have a potions lesson (a baking soda and vinegar concoction like the experiment we did here), explore our knowledge of magical ingredients with a “What’s in the box?” game Jessica has cooked up, and an if-you-dare tasting of Bertie Bott’s Every Flavor Beans. Actually, it is nearly impossible to find Bertie Botts anymore. At one time Jelly Belly was selling the off-flavor beans under the Bertie Botts name, but now they are selling a version called Bean Boozled. The Bean Boozled jelly beans come in regular tasty jelly belly flavors like chocolate and berry blue, but for every normal flavor there is a matching . . . . ummmmmm . . . not so ordinary flavor to match. Flavors like canned dog food and pencil shavings. The trick is that the nasty beans look exactly like the regular ones, so you never know what you are going to get! The box comes with a spinner, so we plan to have each child spin, pick and taste – if they dare! If the weather holds out we have a great scavenger hunt planned in the park down the block. 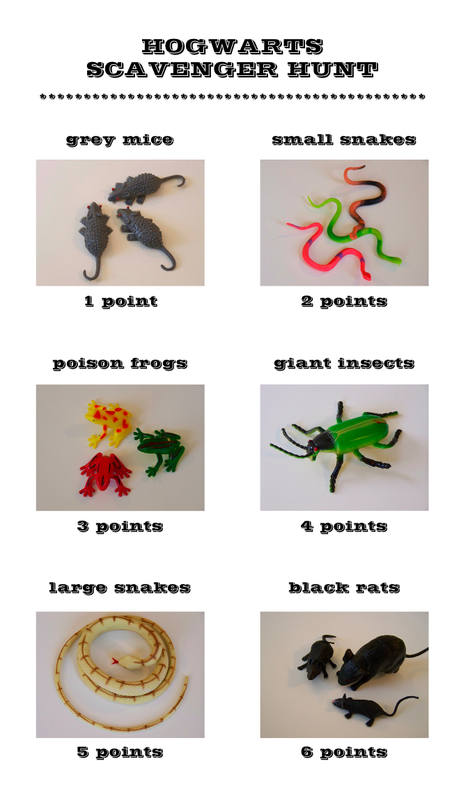 We have a collection of plastic rats, frogs, snakes and the like that we will hide in the park. The kids will hunt as part of their house team and will earn points for each item they found – the more “rare” the find the more points they earn. And then, of course, there is the food! We are sticking with pizza for lunch – can’t get a much easier crowd-pleaser than pizza. And with the pizza, butterbeer of course! There are loads of recipes out there, some of which sound incredibly complicated. The one I found here sounded like the easiest, and with everything else going on I think easy is key. We gave it a test run over the weekend, with mixed reviews. Fletcher loved it exactly as prepared. Lola Gray, however, did not like all the foam. And I had to agree with her. 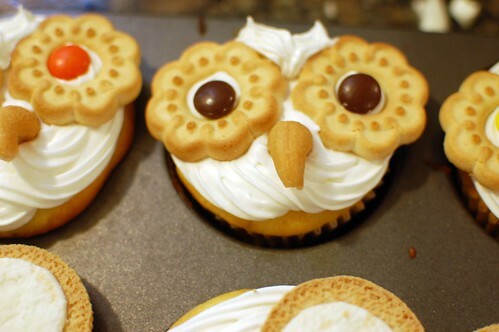 The stuff is sweet – think cream soda topped with whipped cream and you’ll get an idea. I started out with gobs of cream and have been gradually testing it out with less and less. Honestly, I think I could just serve cream soda, call it butterbeer, and be done with it. But Fletcher likes the cream, so we will compromise . . . with a tiny, tiny, tiny bit of cream on top of the soda. We’re going to split the feasting up a bit – first pizza, then some more games, then cake and ice cream. And to go along with the cake, magic color change sodas. I found the idea here and absolutely can not wait to give it a try for the party! And then of course there will be chocolate frogs and licorice wands, a wizard hat pinata, Quidditch broomstick party favors . . . photos of all to follow soon!! Oh! 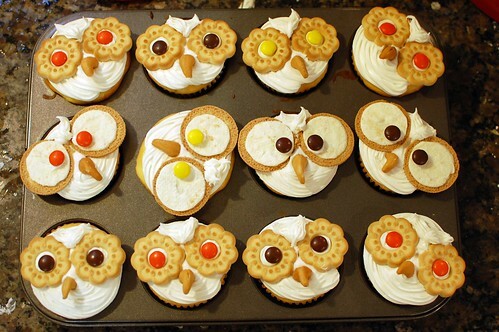 And I can’t forget the cupcakes! 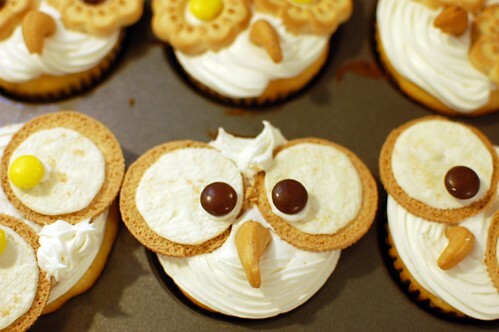 Will’s dad is tackling the extravagant Hogwarts castle cake for the party, but for Fletcher’s school buddies today, snowy owl cupcakes in honor of Harry’s owl Hedwig. How cute are they?? In case you can’t tell, we are having a ball planning this party! Such a fun theme – with so many possibilities!! I'm a mother, an artist, a college professor and a wannabe photographer. Just tryin' to keep it all together and have a little fun in the process. Mamma loves . . .
"Thinking is more interesting than knowing, but not as interesting as looking"